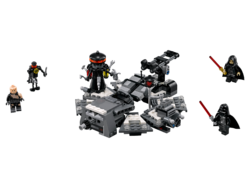 75183 Darth Vader Transformation is a Star Wars set released in 2017. Bring Darth Vader to life at the medical bay! Recreate Anakin’s transformation into evil Darth Vader with this LEGO® brick recreation of the medical bay scene from Star Wars: Revenge of the Sith. This detailed set features a table with space for Anakin that lowers and flips to reveal Vader, Emperor Palpatine’s greatest creation. You can also slide his iconic helmet into position and, like he did in the movie, pretend to use the power of the Force to send the buildable droid and Lightsaber rack flying! This multi-function set includes 3 minifigures and 2 buildable medical droid figures. 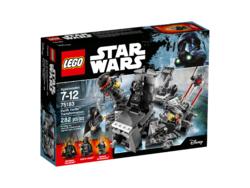 Includes 3 minifigures: Emperor Palpatine, Anakin Skywalker and Darth Vader, plus 2 buildable medical droid figures. Features a double-sided, raising table to attach Anakin and Vader, helmet applicator, Lightsaber rack and Force explode function. Also includes 2 Lightsabers and medical tool elements. Lower Anakin on the table, twist the handle and raise evil Lord Vader! Push the applicator to place Vader’s iconic helmet into position. Activate Vader’s Force powers to send things flying! Measures over 3” (10cm) high, 6” (17cm) wide and 8” (22cm) deep. 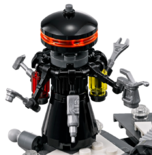 Facts about "75183 Darth Vader Transformation"
This page was last edited on 9 February 2019, at 22:08.